Saifullah Khan — the Yale student who was suspended in October in response to new allegations of sexual assault against him— will not return to campus this semester, as his legal battle to return to Yale has been postponed until January. Khan, who was acquitted on four counts of sexual assault in March, was suspended on Oct. 7 — two days after the News published allegations of sexual misconduct levied against him by Jon Andrews, a former confidant of Khan’s. Three days after this emergency suspension, Khan filed a lawsuit against Yale and Yale College Dean Marvin Chun in New Haven Superior Court, accusing the University of breaching its contract with him. In the lawsuit, Khan and his lawyer requested that the court permit him to attend classes immediately. Khan’s court hearings, which were originally scheduled for Nov. 9 and Nov. 13, were postponed to Jan. 8 and Jan. 9., which means he will not be allowed back on campus until at least the beginning of next semester. 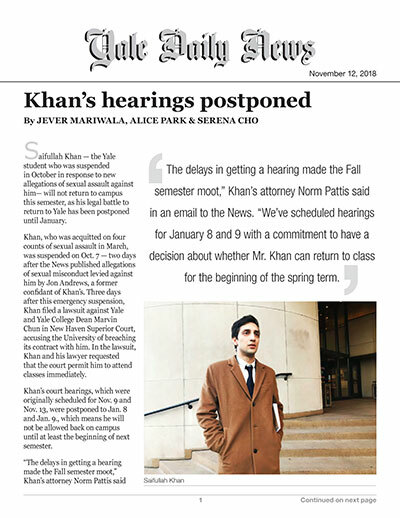 In a court filing last Wednesday, Yale opposed Khan’s immediate reinstatement, arguing that even if Khan returned to classes, he would be unable to complete his coursework for the fall term. Khan, a cognitive science major, had already missed deadlines for nine of 11 papers in four of his courses and had missed several classes by the time of his suspension, according to court documents. Khan is currently being investigated by the University-Wide Committee on Sexual Misconduct for a complaint of sexual assault filed in November 2015, which alleges that Khan sexually assaulted another Yale College student in October 2015. On Tuesday, the UWC held a hearing on the 2015 complaint, which prompted a criminal trial against Khan last March, and is expected to reach a decision by the end of this month. The delay of the recent hearings could pose difficulties to Khan, who is an international student from Afghanistan. During Khan’s first trial, the defense revealed that Khan was at Yale on an F-1 visa, and his immigration status had been in “jeopardy” since his arrest in 2015. Pattis did not respond to request for comment about Khan’s current immigration status on Sunday. According to the University’s website, students who are “withdrawn by the school for misconduct or other violations and do not leave the U.S.” could lose their F-1 student visa, which allows international students and scholars to legally stay in the country. Adviser at the Office of International Students & Scholars Ozan Say said he cannot disclose Khan’s immigration status. Chun also declined to comment on Khan’s immigration status. In the Wednesday court filing, Yale’s lawyers asserted that the University was justified in removing Khan from campus to protect the community. According to court documents, Khan had expressed suicidal thoughts to his therapist and administrators prior to the Oct. 7 suspension. On Oct. 5, he reportedly appeared in the Office of the Secretary and Vice President for Student Life and told Deputy Secretary and Senior Director of Corporation Affairs Martha Schall ’80 multiple times that the resumed UWC investigation had made him feel “belligerent,” according to court documents. Schall, who perceived Khan’s statements as a “veiled threat,” requested police protection for the office. According to the lawsuit filed last month, Khan was recruited to attend Yale after being identified as “extremely gifted” while living in a refugee camp in Pakistan.